The boys’ basketball coaching staff observed something recently about the way the team was playing that they weren’t happy about it. Their solution was, quite literally, eye opening. 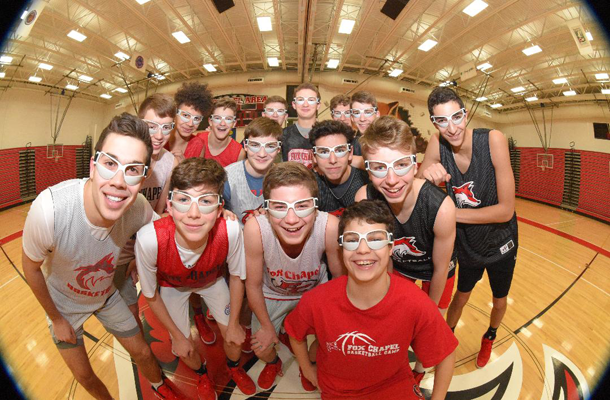 Goggles in a basketball context are used to improve ball handling, shooting, and passing. They force the eyes to remain up so players can better focus on the basketball rim and who is open on the court. Coincidence or not, the fact is that when the players started using goggles, the team enjoyed five consecutive wins. Their sole loss (as of January 18) came at the hands of non-section foe Penn Hills when they lost by one point in double overtime, with only the far side of a minute remaining. Even so, the game was significant for junior Arnold Vento, who scored 26 points and played the best offensive game of his career. The team’s success has them convinced that the goggles are working. So much so that Coach Skrinjar says his players don’t want to take them off. But for the time being, their use will remain limited to practices, and not games. At least not yet!